Luxsego Mixing Spoon is perfect for stirring up all types of beverages. for holiday meals, party buffets, even outdoor entertaining. Whether you are mixing a cocktail or stirring a fruit juices, the extra long handle makes stirring drinks of any height easy and mess free. Made from high quality stainless steel, the Luxsego Cockatil Spoon is odor resistant, durable, and won't rust or break. The spoon is also easy to clean and dishwasher safe. Order yours today! Occasion Applicable - A must-have utensilfor the home, bar, party, coffee shop, restaurant, and so on. Cup Applicable - Gleaming mixing spoon is ideal for deep cups, taller pitchers, carafes, tall glass and cocktails. Perfect for - Evenly mixes drinks, ice cream, milkshakes, juices, dressings, muddled fruits, spices and more. Luxsego mixing spoon, perfect design! Give you a delicious inspiration, April Fool's Day your ideal choice! ★ MULTIPURPOSE UTENSIL - Application for bar, coffee shop, milk tea shop, restaurants, home, party, etc. Versatile utensil fits virtually any cup size. Mixing and stirring desserts, ice tea, malts, beverages, milkshakes, and juice to aid in your drink preparation and without getting your fingers in the drink! Make Flavorful Cocktail with Ease! Perfect gifts for any occasion! 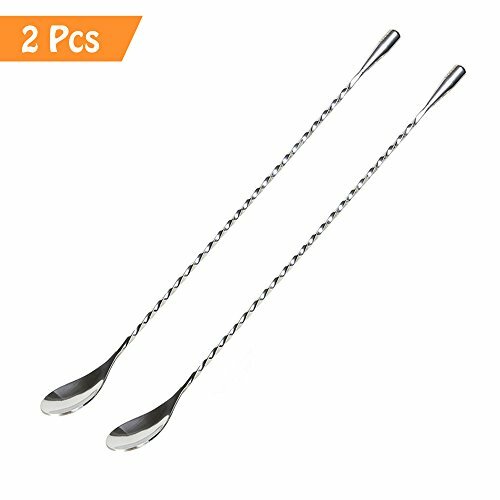 ★ LONG LENGTH & TWISTED MIDDLE - 12 inches extra-l long handle spoons, perfect for mixing drinks, Smoothies. Thin size can reach to the bottom of almost anycup size, so you can go wild and create some giant tasty masterpieces! Spiral Pattern Design for better control and grip, allow you to spin effortlessly. Smooth coil for comfortable stirring. ★ TEARDROP & ROUND END- Beautiful teardrop bottom design creates perfect counterbalance to spoon end for fast and easily mixing. Make it easily assigned to each glass. Nice round end makes it easy to swizzle a drink if needed. ★ PREMIUM STAINLESS STEEL - Made of premium grade stainless steel for superb durability and corrosion resistance, easy maintenance and dishwasher safe. You don't worry it trust or break! Makes it easy to mix like the pros do, a mixing Spoon, that you can use over and over again. ★ DISHWASHER SAFE & LIFETIME GUARANTEE - Easy clean and dishwasher safe! High quality assurance and perfect design of Luxsego mixing spoon make you use more convenient.